Our Koffler A826 Designer Wall Guards are made from high tested strong PVC plastics. They come in 3 different sizes for maximum protection and can be installed easily using either the aluminum retainer or our new EZ Clip method. 1 1/2" 1 1/8", 2", 3", 4" 5", 8" widths . Install using aluminum retainer; or use the cost-saving EZ Clip System (5" and 8" widths only)..
Quick ship available in these colors only: ivory, tan, champagne, eggshell, silver gray, teal, linen white, and windsor blue. All other colors may be 4-week lead time. Wall Guards provide the first line of defense against everyday vehicular and pedestrian abuse in high-traffic areas and can dramatically reduce maintenance and repair expense over time. These guards are specifically designed for larger wall spaces and maximum impact protection against wheelchairs, carts and furniture impacts. Can the customer cut these to needed length? Once up how do you remove the end caps to relocate rails? 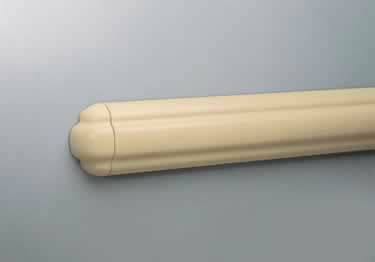 Plastic Designer Wall Guards provide continuous wall protection along corridors and halls. Made from high tested strong PVC plastics mounted to a strong rigid brackets meets ADA requirements. Looks great in the Retirement Homes dining room. Is holding up very well.